10 Minute Homemade Puff Pastry, so fast and easy and so much better than store bought. You will wonder why you didn’t do it sooner! I have been dying to make puff pastry for years, since the first time I saw my sister-in-law make it. Unfortunately I kept putting it off and putting it off because it was always just too much work and time consuming. There was always something to be done and besides there was always the grocery store where I could pick up a really good pre-made puff pastry. 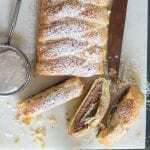 I was lucky enough to find this recipe on the Food Network website saved as the “Quickest puff pastry recipe. Now this was an amazing discovery. I can make puff pastry and save myself so much time and effort. Yeah I like that! There are probably only about three Italian desserts that are my absolute favourites. I love a really good Crostata , Nutella Chocolate Layer Cake and of course Puff Pastry, which in my opinion is so under-rated. This is a pastry that is flaky , crispy and buttery. And another bonus point is, that you can fill it with any filling that suits your tastes. 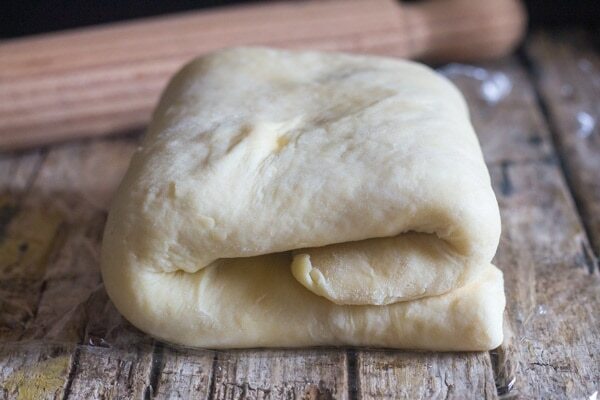 I used my food processor to bring this puff pastry dough together and it was so easy, a few pulses and you are ready to go! One thing I noticed is you have to make sure to keep your surface lightly floured all the time, lightly flour your rolling-pin also. Of course your dough will have bits of butter throughout but don’t worry, that is what makes this dough flaky. This time, I decided to make 2 recipes with the Homemade Puff Pastry, a savory and a sweet. With the first part, I rolled the dough into a rectangle, lined it with slices of Cooked Ham and Shredded Gruyere Cheese, although any cream cheese would work. I rolled it up as tight as possible, wrapped it in plastic and refrigerated it for about 20 minutes. Then with a very sharp knife I made 1/4 inch slices, placed them on a parchment paper lined cookie sheet, sprinkled a little more shredded cheese and baked them for about 20 minutes. 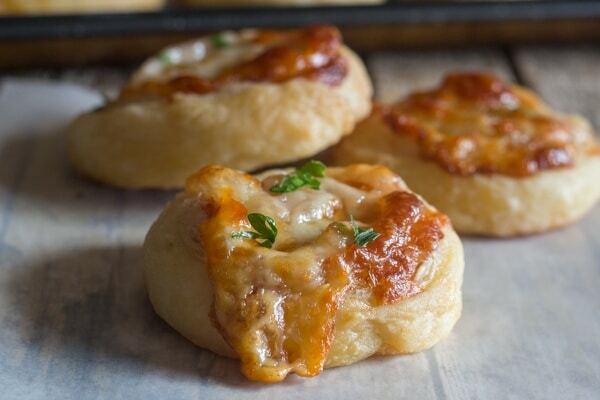 They make the perfect appetizers and were gone in minutes! The remaining dough I rolled the pastry into a circle and made 8 triangles, on each triangle, on the bottom (large part) I placed one or two thin slices of pear, some chopped walnuts and a sprinkling of chocolate chips. I then rolled them up starting at the bottom (large part) and placed the on a parchment paper lined cookie sheet. I brushed them with an egg wash and baked them for about 10-15 minutes. Let them cool and a little dusting of Powdered Sugar is all they need. If pears aren’t to your liking then you could fill them with 2-3 apples slices tossed with a little brown sugar and cinnamon. 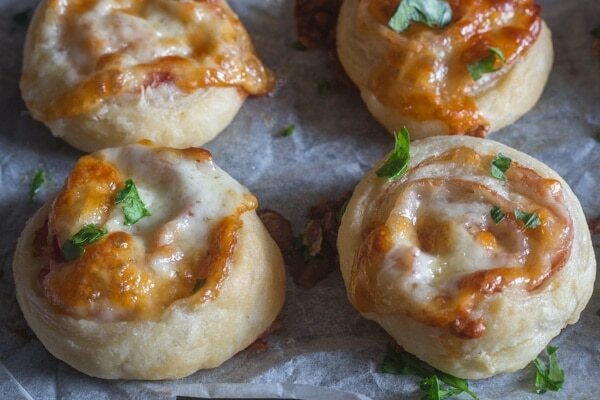 If you have any left over dough you could always make some double cheese savory twists. They would be perfect with a big bowl of Soup or Stew. I hope you decide to give this 10 Minute Homemade Puff Pastry a go. Let me know what you think and how you filled yours. Enjoy! 10 Minute Homemade Puff pastry, fast and easy, flaky and buttery, better than store bought. The perfect dessert, just add the filling. 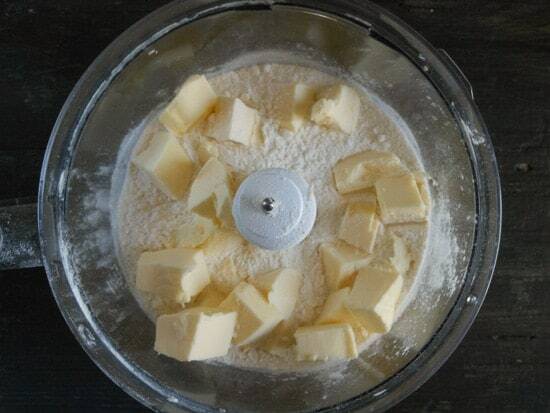 **If using salted butter then add 1/4 teaspoon salt if using unsalted butter than add 3/4 teaspoon salt. Using a food processor, fitted with the metal blade, add flour and salt to the bowl, then add 3/4 cup (170 grams) cold butter cut in cubes and pulse until butter is absorbed (about 10 to 12 one second pulses), then add the remaining cold butter (cubed) and pulse two or three times (no more) to combine, add the cold water and pulse four or five times just until the dough comes together to form a ball (really important not to over process). On a lightly floured surface place dough and knead lightly approximately 10 times. 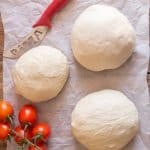 With a lightly floured rolling- pin (lightly flour the dough so it doesn't stick) roll into a rectangle approximately 12 x 18 inches (30 x 45 centimeters). Fold the dough in half and then half again and one last time, wrap in plastic and refrigerate for 1 - 2 hours (I left mine in the fridge for two hours). 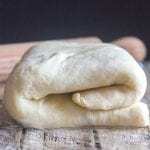 Remove from the fridge and on a lightly floured surface, using a lightly floured rolling-pin roll the dough (I cut the dough in two parts, refrigerate the unused dough until needed) into a rectangle (approximately 10 x 14 inches / 25 x 35 cm). 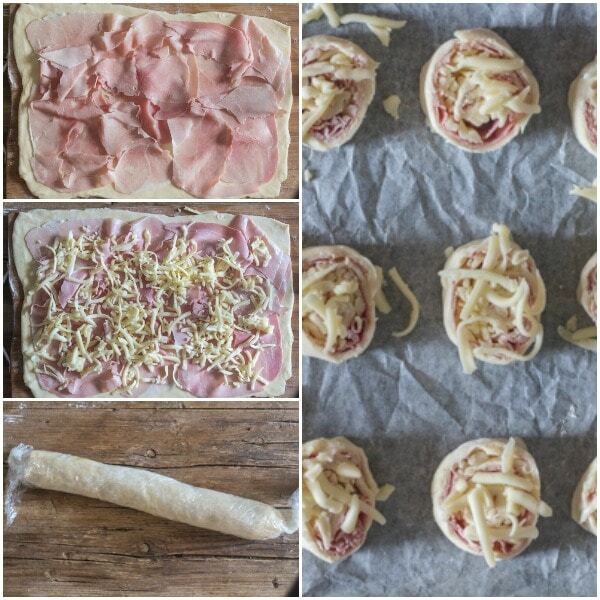 I covered the dough with thin slices of cooked ham and sprinkled with shredded cheese. Roll up length wise as tight as possible and brush the edges with egg wash to seal. Wrap in plastic and refrigerate 20-30 minutes. Unwrap and slice with a sharp knife into 1/4 inch slices. Place on prepared cookie sheet, brush with the egg wash and sprinkle with more cheese, bake for approximately 15-20 minutes or until golden. Serve immediately. 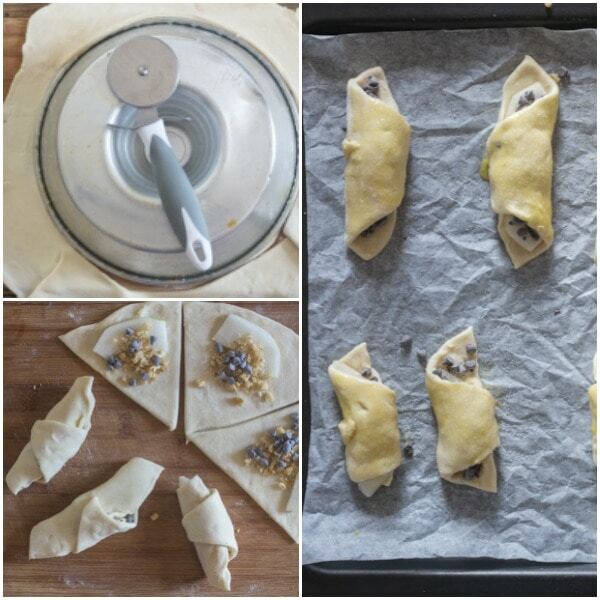 Roll the remaining dough into a large circle, make 8-10 triangles. Place 1-2 slices of pear on the large part of the triangle, top with some chopped walnuts and chocolate chips. Roll up from the large part, place on prepared cookie sheet, brush with egg wash, sprinkle with a little sugar and bake for approximately 15 minutes or until golden. Let cool then dust with powdered / icing sugar. Enjoy. In a small bowl mix together Parmesan cheese and chopped parsley, set aside. Roll (1/2 or 1/3) the dough into an 1/8" thick oval, sprinkle shredded cheese on the top half of oval, bring up the bottom half to cover the top, brush with the egg wash and sprinkle with parmesan cheese mixture, slice into 1/2 inch strips, twist and place on parchment paper lined cookie sheets. Bake for approximately 20 minutes or until golden. Eat warm. Enjoy! In a small bowl toss together, sliced apples, brown sugar and cinnamon. 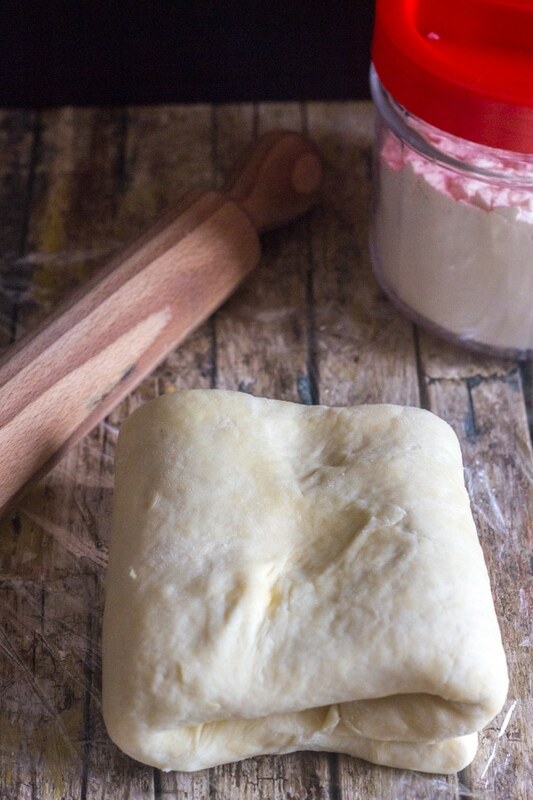 Roll out the dough into a large rectangle or square 1/8 " thick, then cut into 6-8 squares. Top each square with 2-3 apple slices, brush the edges of the square with egg mixture. Fold over and seal. Brush tops of pastry with the egg wash, sprinkle with sugar and bake for approximately 20 minutes or until golden. Drizzle with a little frosting if desired. You can also leave the dough in the fridge over night. 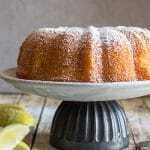 I am republishing this recipe from October 19, 2014 with photo and video updates. Rosemary, it looks so yummy! I love the step-by-step instructions, making it an easy recipe to follow! Thanks Alina, so glad you enjoy it. Have a great Sunday. I made your recipe last night and baked this morning for work. i made some with cream cheese filling and a variety of jams. Everyone loved them. I didn’t give 5 stars because it did not rise as much as I anticipated. Otherwise the recipe is easy to make. I don’t have a food processor – one of the few in the world who don’t. But I used the Ninja Pro Blender Food Processor (first time as a food processor) and it worked like a charm. The only change I made is that I transferred the dough to a bowl and added the ice cold water to the dough to bring it together as I did not want to chance it in the blender. I know how to make traditional laminated dough and just didn’t have the time. Thank you for you recipe. Hi Linda, thanks glad you liked it. Hi Anna, thanks so much I hope you like it, let me know. Thank you, Great Lady! The receipe is amazing!!!! Your very welcome GB, glad you like it. Rosemary, bravo! What a great idea! Love this. I’m sure this is incredibly delicious! Thanks Olga, it really is. Have a great week. Thank you for sharing. It was a hot mess in the beginning but ended up quite delicious. I used it to make apple turnovers. It was flaky and delicate. However I would like to get more layers. Should I add more folds? Does the thickness matter for this purpose? My cut squares ended up being about 1/8in thick. Yours looki much thicker than that. I’m wondering how the thickness potentially affects the final outcome. Thanks! Hi Amara, thanks glad you enjoyed it. I would try with more folds that should definitely help. I think mine were about 1/8 inch also, try going a bit thinner and see if that helps. Perfect! God bless your talented heart and hands! Thank you sooo much for sharing this. So flaky and yummy! 100% flawless recipe, THANK YOU! I was nervous about attempting my first puff pastry lamination, but you helped me kick that fear square in the junk! “Thank you” doesn’t say enough! I used this recipe for small Brie chunks from leftover small wheels from a Costco and they were divine! The whole family of picky eaters DEVOURED every cheesy bomb! Next weekend, I’ll make puff pastry recipe again for the apples and cinnamon sugar you suggest as well as more Brie bombs. Same here . I couldn’t believe I was able to make puff pastry from scratch in two hrs. Perfection! I did not see the video you recommended. I went to the Food Network website and it didn’t have one. Hi Mitzi, at the beginning of the post I wrote “Be sure to watch the vide”, underneath that is the video. Hope that helps. In the recipe where it talks about the salt to ad is salted vs unsalted butter it says to add 3/4 tsp butter is that suppose to be salt? Hi Michele, yes thanks, I corrected it. Happy New Year. I am wondering about making this without a food processor also. I literally do not have room for one in my tiny kitchen, but I do have a Kitchen Aid Stand Mixer. Have you received any feedback using the stand mixer yet? How exciting to be able to make fresh puff pastry! Thank you! Hi Cynthia, I haven’t tried it with a stand up mixer, but it may work using the paddle attachment. If you try it, let me know how it goes. Hi Dallin, thanks for letting me know you made it by hand. Are we suppose to just guess on the cook time? Nice one.Cant I make it without food processor? I have kitchenaid stand mixer. Is it possible to make in that? Hi Pooja, thanks, I m sure it would work with a Kitchenaid too. Let me know how it goes. The recipe says the serving size is ‘1 dough recipe’, does that mean it’s roughly equivalent to 1 sheet of frozen puff pastry? 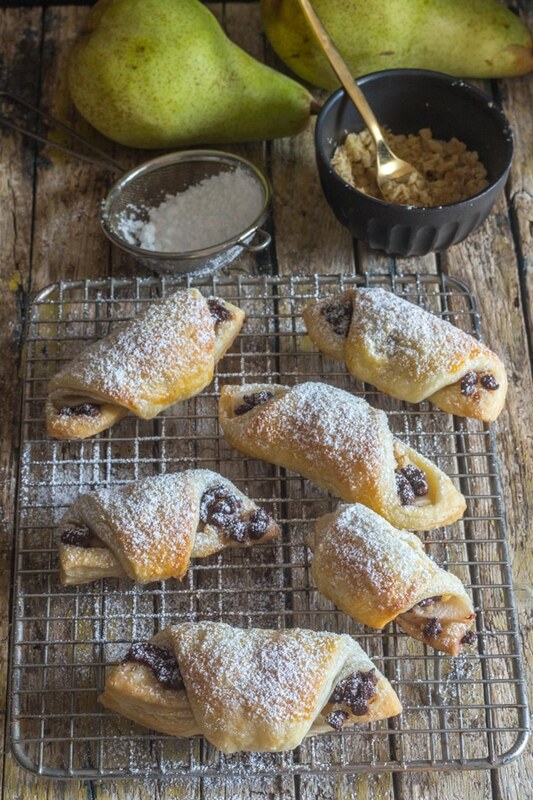 I found a danish recipe I want to try, but it calls for ‘2 frozen puff pastry sheets’. I’m trying to figure out if ‘1 dough recipe’ is equal to ‘1 frozen puff pastry sheet’. Hi Kathy, yes you can freeze it as long as you wrap it well (air tight). It will keep up to 6 months if it’s wrapped well. Hope that helps. Have a great weekend. Hi Ika, it should stay quite crisp if it isn’t filled, unfortunately once it is filled after a bit it starts to get soft. So what I do is fill it just before serving. Hope that helps. I can’t believe I don’t have to buy puff pastry anymore. My granddaughter made the dough Sunday morning and left to go to a soccer game. She was going to make garlic pinwheels (a puff pastry recipe) for a dinner I was having. Well, the dough remained in my refrigerator until today with me hoping I did not have to throw it out. It was still good. I made cinnamon/sugar rolls and they turned out great. The crust is flaky and, in my opinion, much better than store bought puff pastry. Since the dough was left in the refrigerator for two days we can definitely make it ahead of time and use it on the day it’s needed. Thank you so much for another great recipe. Hi! I tried the recipe today. First of all I’d like to thank you for such an easy recipe. It was the only reason I tried it! ? I halved all the ingredients because I wasn’t sure how it’d turn out. I put some spicy minced beef in it and baked it. It looked great but when I tasted it it was quite crumbly. It was light though. I am not sure if it’s supposed to be so crumbly and flaky? Is it? Or did I do something wrong? I’m definitely going to try this recipe. You can’t go wrong with it. 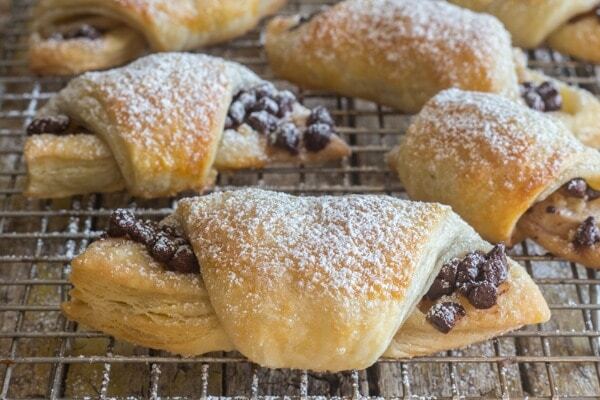 Who doesn’t love puff pastry? Thanks for sharing. Hi Ann, thanks, let me know how you liked it. Have a great weekend. I’ve never made homemade puff pastry! Can’t wait to try it out once we get back home to our food processor. I’m pinning it for later. Buona gioranta! Thanks Marisa, hope you enjoy and let me know. Have a great week. Never thought I could make this so quickly- love it, totally pinning! Thanks Rachel, it really is worth trying. And thank you for pinning. I am excited to have this recipe but wondered where the 10 minutes comes in. You take 30 to prepare, 2 hours to cool, 20 to bake. But anyway thanks for the homemade puff pastry recipe. Hi, thanks, you assumed correctly! Have a great day! Can I assume the 1 cup…….. should be whipping cream?